We have factory wiring diagrams for both BMW and Mini up to 2007 as included in the BMW and Mini WDS (Wiring Diagram System) DVD's from September 2007. Note that the WDS System is not mobile friendly. The minimum screen resolution is 800 x 600, and only some mobile browsers may render the images properly, and most cannot run the Java applet required to render the menus. We are providing the entire contents of the BMW and Mini WDS here for your convenience in all languages as provided on the WDS originally. 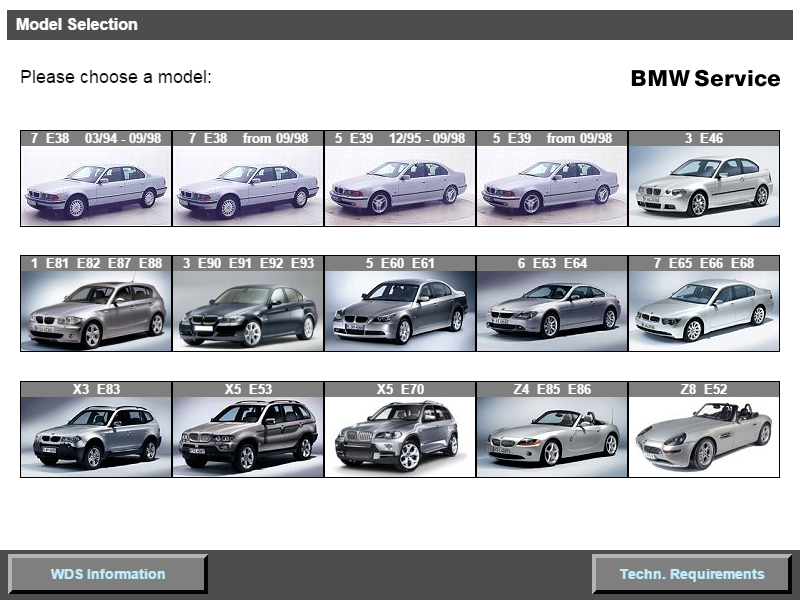 The on-line version of the BMW WDS is identical to the normal "as-shipped" BMW WDS for content and usage, but for our online version the code have been modified to work on most any modern browser that supports running Java Applets. The only non-functional operation is clicking links in the diagram to open the appropriate tree link for the component; online the links will work in Internet Explorer 5.5 to 8 only, and when the browser is using the Adobe® SVG plug-in. This is due to how the WDS was originally structured around the SVG plug-in. The funtional links issue does NOT apply to our DVD version, with this, all the code has been modified to correctly function on any supported Windows version, with Internet Explorer from 8 onwards. Click here! We are now offering 100% functional BMW and Mini WDS DVD's for installation on any Windows version. Click here! Because the original BMW DVD's you commonly find available elsewhere, such as on ebay, Amazon or forum downloads will not run 'as delivered' on any modern computer system, we have modified the programming to allow them to run on current PC's 100% correctly. Our DVD version contains just the files for one of the sixteen available languages along with the early model (1982 onwards) Electronic Troubleshooting Manuals (ETM) in PDF format. These PDF files for JUST the early models and are only available in English. All other content functions as originally intended. Below is the on-line BMW and Mini WDS. While it is functional, it is not as functional as the DVD version. ALL IMAGES AND TEXT ON THIS WEBSITE ARE CREATIVE PROPERTY AND COPYRIGHT (©) OF PSS-AUTOSOFT. THE NAMES OF THE THIRD PARTY SOFTWARE MENTIONED ON THIS WEBSITE ARE THE COPYRIGHT OF THE RESPECTIVE SOFTWARE OWNERS AND ARE USED IN AN EFFORT TO DESCRIBE OR SUPPORT THE INCLUDED SOFTWARE. ALL RIGHTS RESERVED.